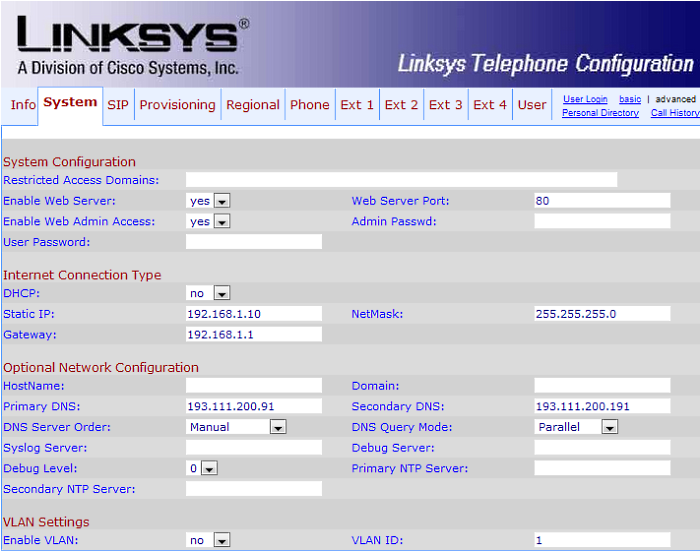 This article is intended to assist you with setting up port forwarding on your Linksys phone. Please read this guide if you need further help with port forwarding. Please press the "Folded Page" icon located on the front of the phone followed by the digit 9. The phone should then show the IP address. This is usually in the format of "192.168.1.10"
Type the phones IP address into the top of your internet browser at the of the page and hit enter or return on your keyboard. You should then be prompted to login to the phones web interface. C;ick on the Admin Login link located in the top right hand corner of the page. Now that you have logged into the phone as "Admin you will be able to statically assign the device a IP address. To do this, please click on the Advanced tab in the top right hand corner of the page followed by the System tab at the top of the page. In the section entitled Internet Connection Type select No for DHCP, and then use the remaining boxes to enter in your network details. Below is an example of the configuration. In this case we have used the phone's current IP address (192.168.1.10) as the static IP address. This is commonly done because you know that specific IP address is currently available. Click Submit All Changes once you have entered the IP details. In order to set the phone's SIP Port, click on the Ext 1 tab at the top of the page. Further down this page you will see the SIP Port section, which is where you need to enter the relevant port. By default, the phone will use the SIP Port 5060. If you have multiple phones on your network, it is important to stagger the SIP Ports in increments of 2 per phone. For example, the first phone would use port 5060, The second phone would use port 5062 and so on. Please see this article for more help with this. Click on Submit All Changes at the bottom of the page when you are done..
Click on the SIP tab located at the top of the page and scroll to the RTP Parameters section. By default, the port range will be set to 16384 through to 16482. If you are using multiple phones on the network, it is advised to stagger the RTP Ports in increments of 50. For example, on the second phone you would open the RTP Port Min as 16532 and the RTP Port Max as 16582. Please see this article for more help with this. Click Submit All Changes at the bottom of the page when you are done.